Fall is For Families! · KenMar Photography Inc. Facebook Twitter Instagram Pinterest Client's Area Search this site. Thank you for choosing us as your photographer. Now that you’re a part of our photo family, how about a family reunion? Let me show my appreciation through a special offer. You’ve wanted family portraits for a while and now you have an extra great reason for doing that: You have a complimentary family session waiting for you at KenMar! As a previous client you already know our quality, you know you’ll look better, and you know you’ll have fun. Incorporate your family’s passion in your portrait. There are only a few appointments available for this! Will you be one of the lucky ones? Only if you call right away! 920 734 5328 is the number but you can always leave a message on our Facebook Page. Warm and golden sun bathed leaves bursting with color. The optimal background now available through the courtesy of mother nature. Book your time now! This scenic splendor lasts but a few weeks. Time changes everything: seasons, leaves, families… but your memories will forever remain, captured by Todd at KenMar Photography, Inc.
Beautiful landscaped areas just 20 seconds from the convenience of your dressing room! Landscaping created for photography just 20 seconds from the convenience of your dressing room! Variety, convenience, comfort, guaranteed professionalism, right here at KenMar Photo Gardens. Outdoor Fall landscaping right here at the studio! Fall photo tip: It’s far better to be photographed earlier in the Fall when the leaves just begin to turn color. Why? 1) One strong rain, one brisk wind, one night of frost and all your color may be gone. What if that happens on your session date? 2) A few bright crimson and auburn leaves are better accented among the greens. You will be too! 3) Once you have bare trees you can see through them to the sky. Dead trees and bare sky are not what you want! 4) In post production the green leaves can be changed to autumn colors. It’s a lot easter than trying to put the leaves back on the trees! Click and open this image to see before and after Fall colors added in post production. This “Leave A Reply” area is very handy! let’s link to a reply in our senior area of the site that goes to the blog where there’s an interaction of information. 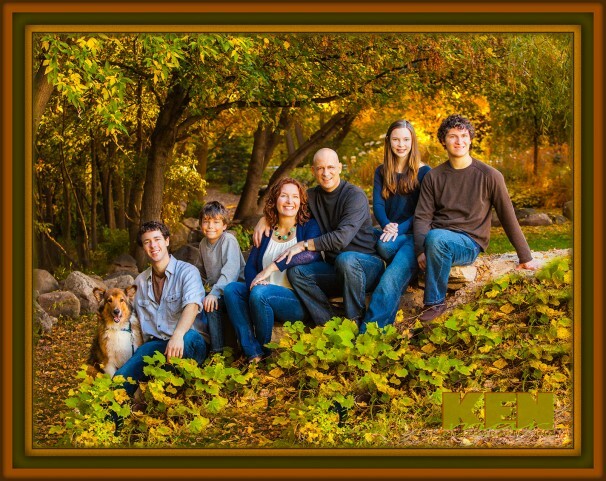 Fall for family fotos at KenMar!